WARNING REGARDING HYDROGEN PEROXIDE Click here to Read!! Therefore regardless of whether 500ml, 1 Litre, 2.5 Litre or 5 Litre (2 x 2.5L) pack sizes are shipped in the 5Kg carton, the freight cost will be the same. Hence, since products such as 30 & 35% Hydrogen peroxide (Pharmaceutical and Food Grade) have a shelf life between 2 – 4 years (if kept refrigerated) it is worth considering to purchase a larger pack size and possibly distilled water (1L) to fill the 5Kg carton. THE ULTRAPURE HYDROPURE 3% & 35% PHARMACEUTICAL GRADE ARE HIGHER, PURER GRADES OF HYDROGEN PEROXIDE THAN THE NORMAL FOOD GRADE. NOTE : FOR REFRIGERATOR CONVENIENCE, 5 LITRE HYDROGEN PEROXIDE SOLUTIONS ARE SUPPLIED AS . . . . 2 x 2.5L – AT NO ADDITIONAL COST !!! All FOOD GRADE & PHARMACEUTICAL GRADE HYDROGEN PEROXIDE SOLUTIONS ARE MAINTAINED IN REFRIGERATED STORAGE AND PACKED IN SEVERAL LAYERS OF ALUMINIUM FOIL & BUBBLE WRAPPED PRIOR TO DISPATCH VIA COURIER. NOTE: HYDROPURE 35 (DANGEROUS GOODS) MUST BE DISPATCHED VIA COURIER, WHILE HYDROPURE 3% (NON –DANGEROUS GOODS) CAN BE DISPATCHED VIA AUST. POST. 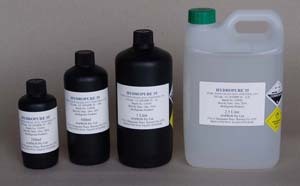 Used in the preparation of bentonite fining trials.